Inbound Marketing isn't limited to just online. 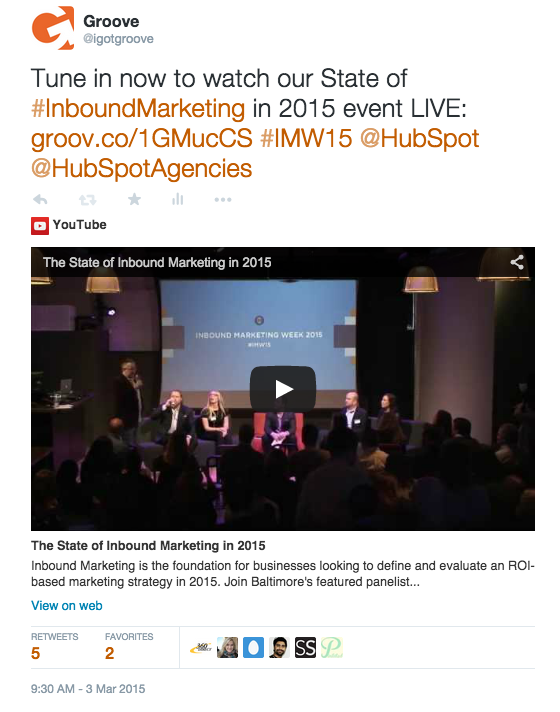 Learn how to promote your events with Inbound Marketing from beginning to end using HubSpot. We all know that Inbound Marketing is an incredibly successful way to garner new customers and ultimately sales for your company online. The power of HubSpot isn’t limited to just online advantages, though. It can also be implemented at special events and industry conferences to better attract, convert, close and delight leads, too. Before your event, you’ll want to lay some groundwork so you’ll be able to get the most out of it. From setting up forms and workflows in HubSpot to working on some catchy creative collateral: you’ll set yourself up for maximum success at your next event. Set up your event page early – The key to a successful event is getting it out early so your attendees can plan ahead for it. Make sure you have all the information about the event in one location so it’s easy for your attendees to learn about the details. Link your event to a HubSpot landing page to collect registrations – If your company is hosting the event, you’ll want use this landing page to promote registrations and collect attendee contact information to send them event updates and follow-up information. If your company is attending an event such as a conference, you can use this landing page to register prospects and provide offers like free, on-site consultations. Start sharing socially – Design creative social images to announce your event and company’s involvement with details like the date, time and location. Writing a blog or two to promote the upcoming event and your company’s involvement is a great way to encourage people to attend. Be sure to end your blog posts with CTAs leading them back to the event’s landing page for registration. Get others involved in social sharing – Do you have any well-known speakers or sponsors that are involved with your event? Get them involved with promoting the event online to increase the overall audience reach. Be sure to tag them in posts and design an event hashtag for viewers to learn more. You can even encourage social promotions with free giveaways and discount ticket offers. Set up email reminders before the event – Be sure to send pre-event emails reminding people to come see you at the event and to keep them posted about any changes. This is where you hit the ground running. You’ll need to take a full approach from personal engagement of your company’s representatives who are on-site to live social media coverage of the event. The key ingredient here is to engage and attract attendees so you’ll be able to convert them into leads. Capture who attends the event with HubSpot forms – Have company reps use tablet devices with HubSpot forms/surveys that you set up prior to the event to collect information from attendees (don’t forget to use those giveaways as an incentive). Tip: We use the iCapture on our iPads to sync our forms back to HubSpot. Engage on social media in real-time – Post quotes and photos of the event live via social media using the event’s official hashtag to encourage attendees engage online. Share links and resources so those who can't attend your event can get involved through social media. Send a thank you email to attendees who filled out your forms/survey on-site – We suggest sending this email 2 hours after submission. Your engagement is only as successful as your follow-up. A good Inbound Marketing follow-up strategy will keep the event front of mind for the leads you attracted, and will ultimately help make the sales process that much easier. Follow-up workflows – Set these up in HubSpot to touch base with your attendees after the event to ask for feedback via a survey and thank them for attending. Keep them updated – Post a blog recapping the event, a copy of the presentation or any other helpful resources your attendees will find interesting. Send out social thank you notes – Be sure to socially thank speakers and anyone who interacted with you at the event. These are just some of the many ideas you can use to help drive traffic and leads to your business while hosting or attending events or conferences. By focusing your efforts on the three phases of the event, you’ll be setting yourself up for maximum success when it comes to attracting, converting and ultimately closing leads. Are you interested in learning more about how we use Inbound Marketing on and offline? Contact us today! We’d love to help you.